Twill weave with a Glossy finish. Engineered to surpass your expectations. Made of 100% real carbon fiber. A great substitute for a wallet as it will take up less space. SLEEK AND STYLISH: Features Genuine Carbon Fiber an overall slim design. 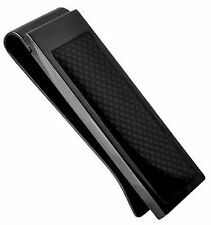 Specification: Device Type: Carbon Fiber Money Clip Color: Black Material: Carbon Fiber Dimension: 2.76 x 1.5 x 0.43in(70 x 38 x 11mm) Weight：0.39oz(11g) Package Includes: 1 x Carbon Fiber Money Clip. 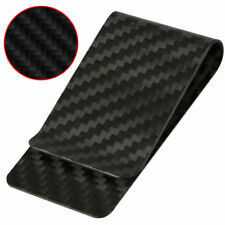 This real carbon fiber money clip may just make you spend your money faster. That's because you'll always want to be taking it out to show it off to others. You'll never have to worry about losing tension because carbon fiber will always go back to its original position, making this one a lifelong product. Material Composition: stainless steel. Model Number: 13850. Twill weave with a Glossy finish. Engineered to surpass your expectations. Made of 100% real carbon fiber. 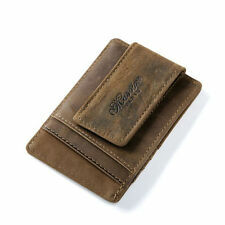 A great substitute for a wallet as it will take up less space. 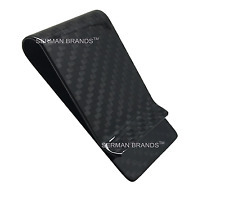 Genuine Carbon Fiber an overall slim design. Material: Stainless Steel. after you have paid. You may also like. Local pick up is not available. Jewelry Sets. NO RESERVE ON THIS WONDERFUL PIECE HEAVY ALL 925 STERLING (Tested). NORMAL LIGHT USE SCRATCHES (Will Polish Nicely) BAG & BOX INCLUDED. Rugged leather with debossed graphics and a classic skull badge mark this durable accessory. Debossed graphics on back. Closure: Magnetic closure. Countless, I bet. Wallet's are not very user friendly at all. 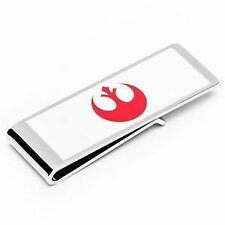 A money clip on the other hand is so easy to use. A simple folding of the bills and your cash slides right in and out with a simple tug or push. Model: #102694. 100% authentic, stainless steel/onyx. Color Silver. Condition New. 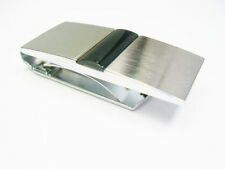 [ BMW Money Clip ] (https://www.ebay.com/str/cufflinkstieclipslapelpins) ► Free Shipping Free Returns ► Ships Quickly in 1-2 Days Tracking ► Handmade in the USA by a Family Business ► Free Gift Box Free Gift Messaging ► Experienced Seller High Buyer Ratings Payment Shipping Returns About us PaymentShippingReturnsAbout us ► All payment methods accepted. ► Ebay keeps your payment information secure. ► Ebay shops never receive your credit card information. On the facing side, Miss Liberty strides towards the rising sun, the eagle is on the back. The bezel has a small screw on the bottom to facilitate coin removal. The coin weighs 1 troy ounce. In most cases I will respond within a few hours. 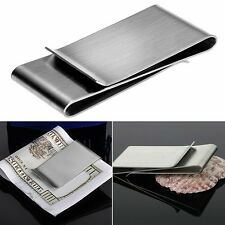 Stainless Steel Money Clip. WE ASK THAT YOU DO THIS TO PREVENT ANY MISUNDERSTANDING, CONFUSION, AND INCONVENIENCE. NO RESERVE. Function: RFID Blocking Style: Credit Card Holder, Money Clip. 1 Card holder wallet. Color: Black Material: Carbon fiber Stainless steel. Lightweight and slim body makes it is suitable to take out with you, you will never feel embarrassed any more for the bulge on the back pockets of your pants. Oval cut out with yellow gold emblem, monogram NC. Up for consideration is a Vintage Siam Silver Tone Money Clip Tiffany Jewelry Bangkok Thailand from ESTATE. This is in good preowned vintage condition so please let photos help determine overall condition for they are also part of the description. NO BOX or PAPERS. Thanks and good Luck!!! Features: INITIAL Alphabet MONOGRAM Letter. Sale Includes: MONOGRAM. Initial Letter Money Clip with Gift Box. Initial Letter. Letter - Initial. Material: Stainless Steel - Slim Clamp Clip. Silver tone Finish. Tiffany & Co Sterling Silver Money Clip / Money Holder 20.93 Grams Silver Total Weight (Stamped Tiffany & Co 925 Sterling). The weight of the clip is 20.93 Grams. We keep a smaller portion of each sale. Metal Purity: .925 Sterling Silver & 14K Gold Width: 32mm (approx.) Height: 54mm (approx.) Weight: 35g . Including one blue velvet jewelry bag Material:stainless steel Color:silver Weight: about 11g Stainless Steel Jewellery does not tarnish and oxidize, which can last longer than other jewelries. It is able to endure a lot of wear and tear. And it is amazingly hypoallergenic. Such advantages make it a more popular accessory. High quality stainless steel has high resistance to rust, corrosion and tarnishing, which requires minimal maintenance. Stainless steel is one of the most bio-compatible metals, so stainless steel Jewellery is amazingly hypoallergenic because of its anti-allergic properties. As one of the strongest of all Jewellery metals, it does not oxidize and will be very durable. All makes it a top fashion accessory to complement your wardro. Vintage Slide Rule Money Clip. Condition is Pre-owned. Shipped with USPS First Class Package. Type: Money Clip. 1 Money Clip. Made from durable stainless steel, sturdy and durable. Material: Stainless Steel. Unique design for holding money. In the 1960s western Sicily was rocked by an earthquake. Such was the devastation, residents had no choice but to abandon their properties and soon the whole settlement were nothing but ghost towns. Rebuilding took place on the lower slopes, and I’ve long wondered what became of my grandfathers workshop I found his tools and grinding wheels dusty yet in perfect condition. They were made with the craftsmanship and care only found generations ago. We’ve given new life to an ancient workshop and made metal goods I know my grandfather would have been very proud of. The Phoenix rises! BULLION COIN IS. 999 PURE SILVER (Tested). BEAUTIFUL PIECE. STERLING SILVER MONEY CLIP with clover motif. Measures 2 inches by 3/4 inches. Weighs approximately 3/4 ounce. Purchased new about twenty years ago. Rarely used. Good condition. Mounted feature is missing. Stamped on back "10K Gold trim". MONSANTO DIAMOND MONEY CLIP . GOLD FILLED 12 KGF WITH INLAID DIAMOND. Measures 2 x 7/8 inches. Ten year service award. New in 1984. Rarely used. 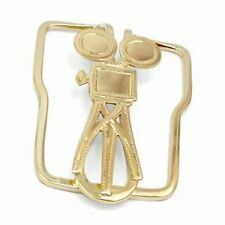 The clip coin mount is generously layered with 24K gold and features a patented spring action that holds even a single bill snugly. Features: Slim Size: 4.4” x 3.2” X 0.2”, this is an ultra slim professional business card case or wallet, compact design for front or back pocket wear; -Top Material: refined top quality cowhide leather, classy and durable - RFID Blocking: with the military grade RFID signal blocking technology, this minimalist wallet will stop anyone from obtaining your information. Wireless readers will not get through our RFID protection - Functional Design: with 5 card slots, 2 functional card slots and 1 large pocket for card, money or receipt pocket, this slim wallet is your perfect companion as it will stay in your pocket and you can hardly feel its existence; Package Includes: 1 x Leather Slim Card Holder Wallet Money Clip. Montana Silversmith 1890 Silver Dollar Money Clip, Nice! HOLDS CASH FROM ONE BILL TO MORE THEN. MONEY HOLDER. THIS IS THE CASH MONEY HOLDER THAT DOES THE TRICK. FOLD YOUR MONEY OVER THE GENUINE LEATHER CASH HOLDER. PULL THE ELASTIC LEATHER BAND OVER YOUR MONEY. Vintage Money Clip Gold Tone Metal 1854 Liberty Coin NOS. Condition is Pre-owned. Shipped with USPS First Class Package.